T. Patterson Ross, the architect of 21 Presidio Terrace, was considered a pioneer in the design of the Mission Revival style, a modern adaptation of the Spanish. Its façade is notable for the curlique parapets (espadanas) and quatrefoil windows, which are the hallmarks of this distinctive of this regional style. The residence is one of 26 homes in the Presidio Terrace Circle carefully and colorfully documented in a wonderful historical picture book called The Historical Houses of Presidio Terrace—and the People Who Built Them”, written and photographed by Patrick McGrew, AIA, 1995. Porch with twin arched windows with fanlights leads to the neo-classical RECEPTION ROOM which features a gracious curved staircase highlighted by stunning leaded art glass windows in the Tiffany style on two levels. The inviting LIVING ROOM looks out to the Presidio greenery. 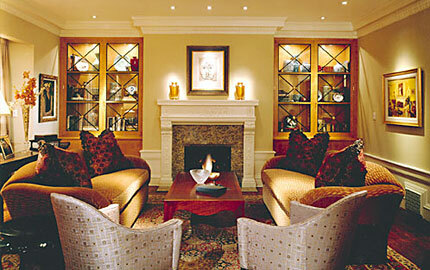 Beautiful maple and glass front display cases sit on either side of the fireplace. 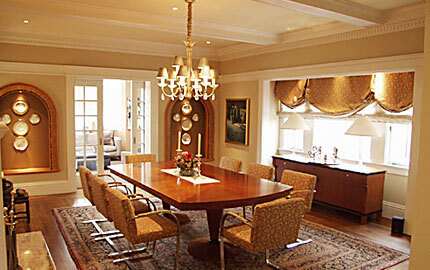 The elegant DINING ROOM has a beamed ceiling, fireplace and matching alcoves for art display. maple cabinetry. South facing paned windows and a large barrel skylight bring in much natural light. 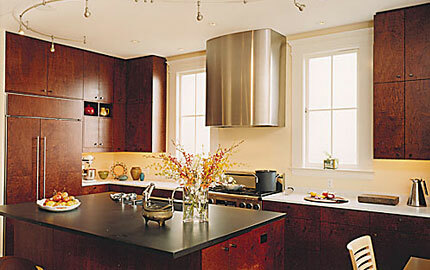 The state of the art sunny KITCHEN with breakfast area is wonderful for the gourmet cook and for informal gatherings. The stylish POWDER ROOM has a black granite tile surround and designer glass bowl on a marble top vanity. GUEST CLOSET and additional storage. The long driveway on the east side of the house leads to the south PATIO/GARDEN and 2-car tandem GARAGE with inside access. 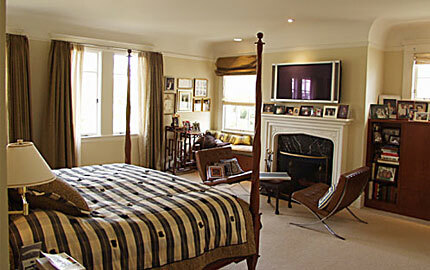 The MASTER BEDROOM looks out to the Presidio Circle greenery. A fireplace sits between double windows with bookcase and bench seating. The luxurious MASTER BATH features indirect boxed lighting, a large island with marble top & maple cabinetry, double sinks & mirror. The deep tub has a stone& maple surround. There is a separate shower and WC. French doors open to the west balcony with Presidio Circle outlook. SW BEDROOM and adjoining BATH with Jacuzzi tub. Adjoining SE BEDROOM or STUDY features a built-in desk/cabinet system ‘S’ track halogen lighting. The convenient Laundry Closet and extra storage complete this floor. Wonderful large attic PLAY ROOM exposed to the rafters. Two BEDROOMS and a shared BATH. Beautiful staircase leads to the large yet cozy paneled LIBRARY/FAMILY ROOM with hardwood floor, built in bookcases, hewn stone fireplace, and upholstered bench seating. Four windows bring in natural light. EXERCISE ROOM, utility room, laundry room and ample storage. 2-CAR TANDEM GARAGE at the rear of the driveway/terrace with inside access. 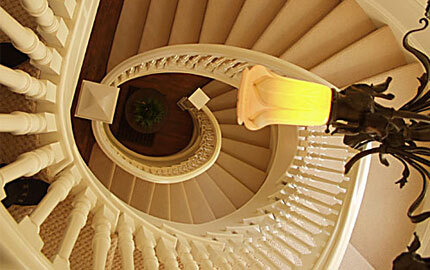 Prospective Buyers are advised to review, prior to any offer, the “Seller’s Disclosure Package” available on request. Taxes will be reassessed upon sale to approximately 1.129% of the purchase price.